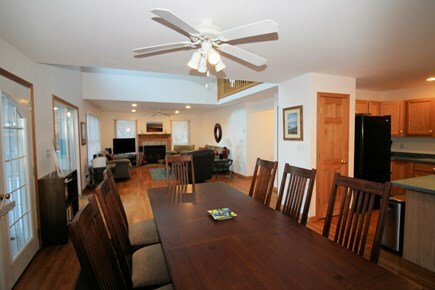 This very comfortable and spacious home is the ideal spot for your Wellfleet vacation! There are five bedrooms and four and one-half bathrooms with plenty of space for the whole gang to come together or spread out. 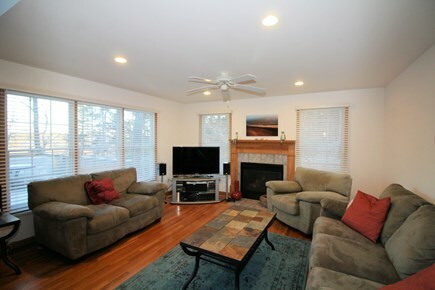 Situated on a private, wooded lot in a quiet neighborhood, it less than a mile walk to Wellfleet's popular center. 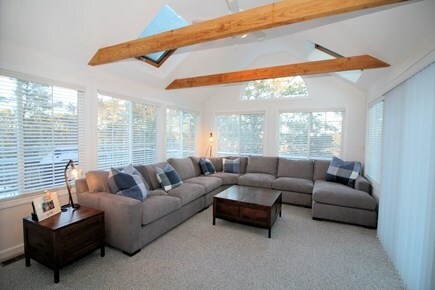 Enter the first floor with an open living room with comfortable seating, flat screen TV with cable and a gas fireplace. The living room opens to the dining area and kitchen beyond. There is a slider from the living room to the deck. A door from the dining area leads to a wonderful sun room with a comfortable sectional sofa, another slider to the deck and skylights. This room is a great spot for enjoying great books, fun games and good conversation! 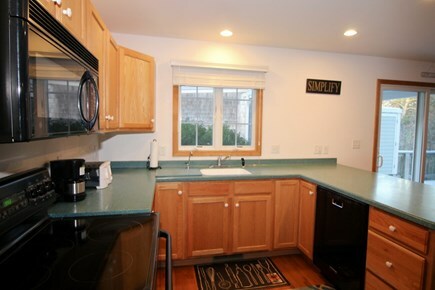 The kitchen is well-equipped and has a breakfast bar. Another slider off the dining area leads to the deck, outdoor shower and parking area. 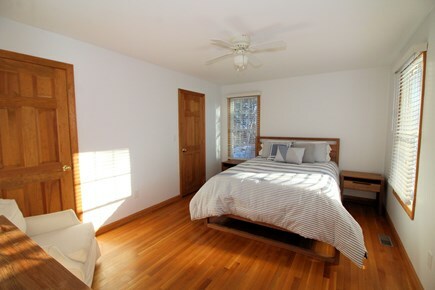 The first floor also has a bedroom with queen bed, television with cable and en suite bathroom with tub/shower. There is a half bath with washer/dryer for convenience. The second floor has two bedrooms. 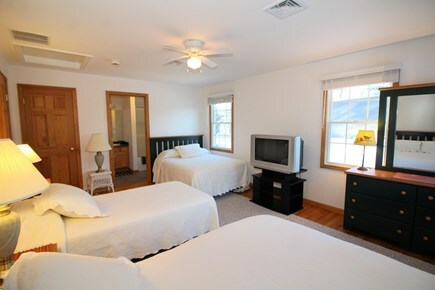 The large master has a king bed and a television with cable. 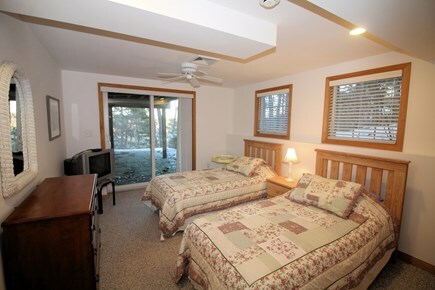 There is a spacious walk-in closet and an en suite bathroom with tub/shower. The master has lovely views of the woods and marsh beyond. 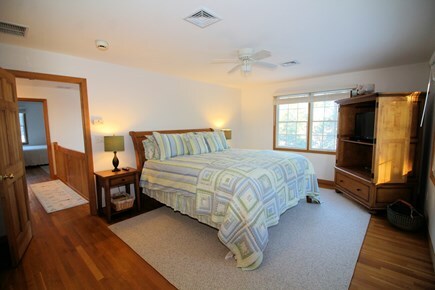 The other bedroom on this floor has two double (full) beds and a twin bed. There is a television with cable and an en suite bathroom with tub/shower. 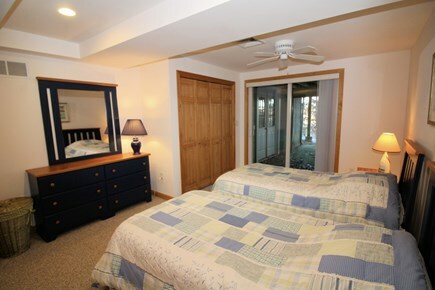 The lower level has two more bedrooms—both have two twin beds and a slider. 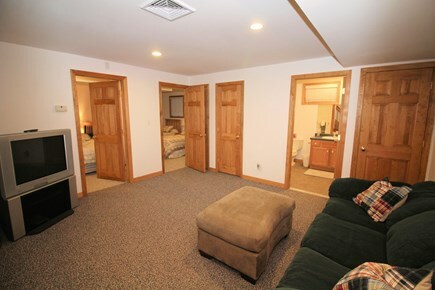 There is a sitting area with sofa and television with cable on this floor and another full bathroom with tub/shower. 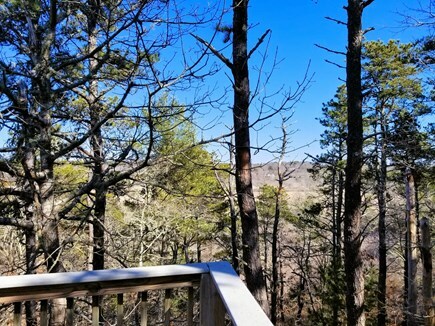 The roomy deck with outdoor furniture has lovely views of the woods and the marsh beyond. Grill out on the gas grill and enjoy the enclosed outdoor shower. There is a garage on the property for owner use only. 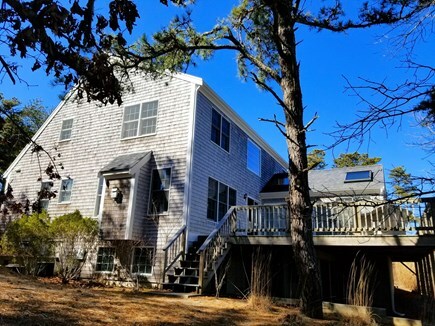 If you love Wellfleet, you'll love this location! 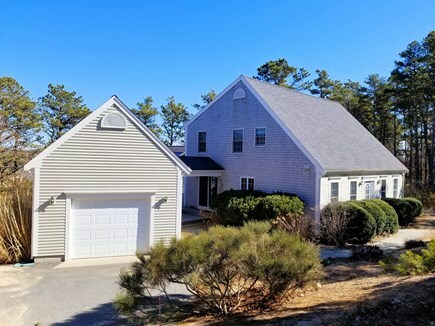 Peaceful, quiet, and only a short walk to the center (0.6 mi to the Wellfleet Public Library). Short drive to all the best spots in this amazing town: the Wellfleet Town Pier, bay and ocean beaches, fresh water ponds, golf, Cape Cod National Seashore sites, trails and beaches, the Cape Cod Rail Trail bike path, the Wellfleet Farmers Market (held weekly), Mass Audubon's Wellfleet Bay Wildlife Center, lectures, live performances and concerts at WHAT, Wellfleet Preservation Hall and other close by venues. 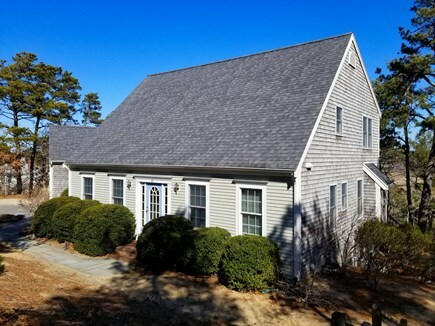 Comforts include central air conditioning, gas fireplace, sun room, washer/dryer, dishwasher, cable, WiFi, enclosed outdoor shower, deck and gas grill. ++ LINEN PACKAGE available upon request for a fee of $410 per week. Discount may apply for multiple weeks. Linen package includes bed sheets, bath towels, hand towels, wash cloths, bath mats, beach towels and kitchen towels delivered to your rental on your arrival day.